Chili sauce was something I really didn’t appreciate until recently. In fact, the only reason we made it was because we had a glut of tomatoes and thought it would be a good idea to try something other than sauce and salsa. 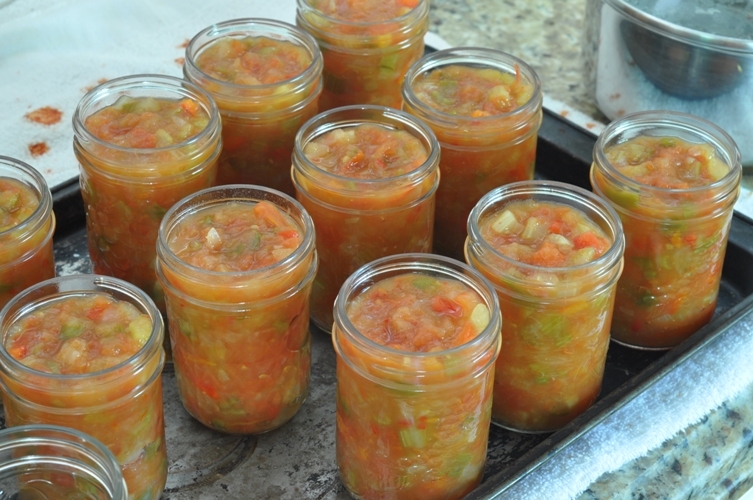 But, once jarred, preserved, and neatly arranged on our canning shelves we didn’t know what we were going to do with it. Then, Matt started combining it in some of our cooked meat dishes, the simplest being homemade meat loaf. A meal which can be traditionally thought of as humdrum becomes rich with flavour when you add some homemade chili sauce to the equation. And, now we will never be able to go back to plain old meatloaf. Blanch tomatoes in boiling water for about 60 seconds or until skins start to crack. Place tomatoes in ice water to quickly cool. Remove skins, seeds, and dice. 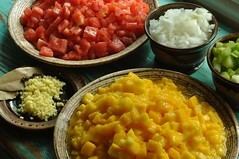 Note: scoring the bottom of each tomato prior to blanching will help to remove the skins more easily. Prepare remaining ingredients. Remove seeds from hot peppers and finely chop. It’s a good idea to wear gloves and use a separate cutting board. 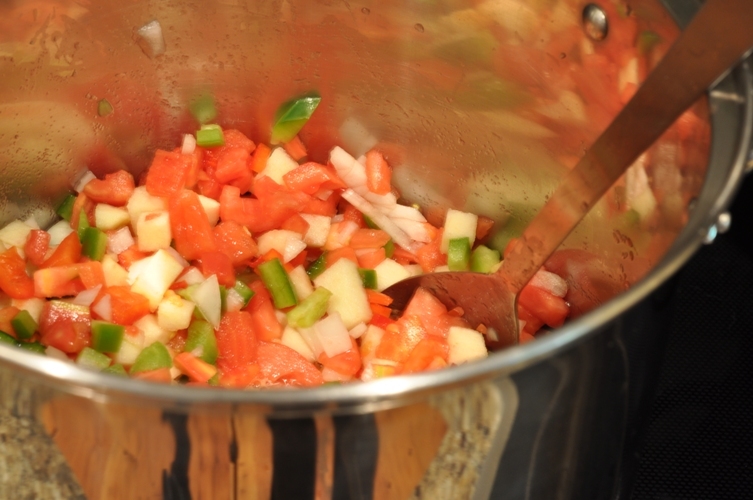 In a large stainless steel saucepan combine tomatoes, celery, apples, green peppers,onions, red peppers, hot peppers, vinegar, sugar and salt. Place cinnamon, ginger, and allspice in a spiceball or a small square of cheesecloth and add to vegetables. Note: the floating mulling spice ball from Williams Sonoma works great for this job. Bring to a boil over high heat, reduce heat and boil gently, uncovered, for 1 1/2 hours or until mixture is thick. Stir occassionally to prevent it from sticking to the bottom. While it is cooking prepare for water bath canning. Sterilize jars in oven at 250F for 30 minutes. When chili sauce is thick remove from heat. Remove spiceball and discard its’ contents. Ladle hot chili sauce into hot sterilized jars leaving 1/2″ headspace. Remove air bubbles, wipe rims, place lids and screw bands on adjusting so that they are just finger-tip tight. Process 250mL (half-pint) jars for 15 minutes and 500mL (pint) jars for 20 minutes in a hot water bath. Note: recorded pH 3.73. While, this recipe is different from last year’s, the combination of ingredients are sure to spice up your families meatloaf or add a little zip to a baked potato. How do you use your chili sauce? We use a digitial pH tester which is very accurate but you can purchase the strips as well. Your pH should be 4.6 or less to be safe for waterbath canning. A pH higher than 4.6 and you must use a pressure canner. We test lots of our recipes to see where they stand ~ this year we tested the tomato sauce prior to adding the lemon juice and it was 4.6 and in some cases 4.7. Once the lemon juice was added it read 3.98. This just shows you how important it is to follow some recipes/instructions very closely. I grew up with a wonderful German/Polish Grandma and I have wonderful memories of her making Chili Sauce. In fact, I just made a batch for my brother. My recipe is a bit different, but the elements of adding spices are the same. We would eat our Chili Sauce mostly at breakfast with our eggs, Kishka (Polish Sausage) and rye bread. Yummy – makes me hungry just thinking about it. Anyhoo all the recipes sound delicious, can’t decide what to make first.